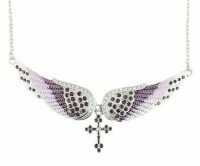 Many shades of purple help make this Ladies Angel Wing imitation Crystal Necklace with a hanging cross, next add the Bling and you have one hot piece. Made from clean 316L Stainless Steel. Also check out the matching Earrings (SSE 68) for that complete set.